Dame Betty O’Dowd, who died in Auckland on the feast of Corpus Christi, made a huge contribution to the life of the Church in the Diocese of Christchurch, indeed in New Zealand. Dame Betty, originally from Auckland, lived in Christchurch for many years. She was a lecturer in history at the University of Canterbury and was warden of Helen Conon Hall and later of Rochester Hall. She had a great impact on many of the students who went there. In 1994, she was made a Dame of the Order of St Gregory. 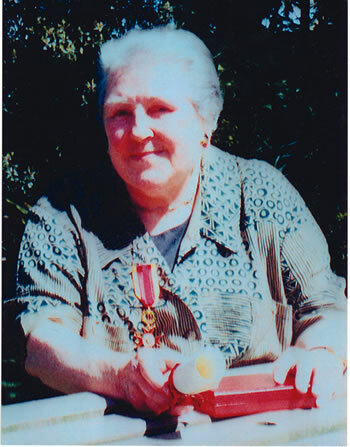 Dame Betty was the first New Zealand woman to receive this distinction. This recognition was for years of service to the Church. This included making known the documents of the Second Vatican Council in the years after the Council through talks and writings at parish, diocesan and national level. She was on the Diocesan Liturgy Commission for many years and contributed to many of their newsletters. In the early 1990’s the Diocese of Christchurch established Good Shepherd House, a pre-seminary for men who wanted to become priests. Dame Betty lectured to the students for many years on Church History. Dame Betty’s service to the Diocese did not stop as she got older. She continued to write, making valuable contributions to the Diocesan magazine Inform four times a year. Even in her 80’s she was giving talks to young adults in the Christchurch Diocese and also at the Hearts Aflame Catholic Summer School. As one Christchurch priest has noted, “Betty had a clarity of thought when it came to things theological.” Besides Church history she was well versed in the theology of Eucharist, the laity, the role of women in the Church and much more. She had a great impact on the life of the Church in New Zealand and will be sorely missed by her wide circle of friends, family and acquaintances .